Fresh Mint & Matcha Energy Ice Cream! Welcome to the world of delicious- and powerful- ice cream! This matcha mint ice cream is dairy-free, packed with freshness and – wow!- it really wakes me up and sets my mind into a creative zone!!! To start, I’ll say that anything to do with green tea appeals to me. My daily cup of tea is something that I don’t skip. After all, a quality cup of green tea of full of antioxidants and other phytonutrients that have been shown in studies to do everything from supporting brain and heart health to stimulating metabolism. The great thing about green tea is that it can wake you up and help you focus without a lot of the side effects of jitter and crash-and-burn that I get from coffee! Matcha is next-level green tea in my mind. Made of ground green tea leaves that pack a powerful nutritional (and mental) punch, matcha is thought to have 10X the nutritional benefits of your standard cup of tea. 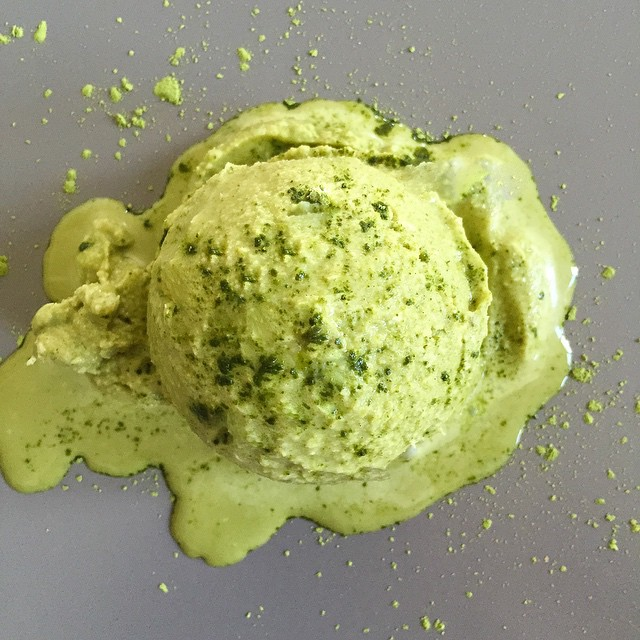 Because it is a powder, matcha combines well with smoothies, creamy drinks and cheesecakes and yes… ice cream! When cooking with matcha, you don’t need much to get the flavor and effects. Too much is too much! Mint is the other component of this ice cream that can be a tonic in itself. Mint can stimulate digestion, it energetically cools off an overheated system in the summertime, it wakes up your mind just to smell mint essences… and, mint is pretty delicious. This ice cream is really easy, and if you are following any kind of special diet, investing in an ice cream machine will pay off in the long run. I’ve had my ice cream maker for 4 years now and since I can’t eat and store-bought ice cream (and prefer homemade, anyway!) I use it so often that it’s been well worth the purchase! Add one standard 14 oz can of full-fat coconut milk without additives like guar gum to a blender. If using fresh coconut milk, just shy of 2 cups will do. Whenever I’m using fresh coconut over canned I add more because I find it luscious. Next add 1/4 to 1/3 cup of fresh organic mint leaves without stems. I do even more than 1/3 cup for myself, but I love mint. Add in 1/3 cup honey, 1 teaspoon (more if you are used to matcha, for me a teaspoon is plenty!) of pure matcha powder and a teaspoon of pure vanilla extract. Blend this until the leaves of mint have vanished into a whirl of green goodness. Add 1/4 cup of unsweetened coconut flakes and blend again for a few seconds to really encorporate the coconut. This adds flavor and texture to your ice cream. Pour this mix into an ice cream machine and churn it for 30-45 minutes. Once it’s looking like a very well-formed soft serve, you can scoop it into a frezer container and freeze for a few hours (at least) before serving. No ice cream machine? You can also try freezing this as ice pops! Whatever you do, just be aware that eating this late in the afternoon or evening isn’t advised by me unless you want to stay awake all night. So so so green-tea-earthy and minty and fresh…! Previous post: Healing Colors & Your Bright Life!